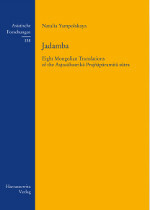 Jadamba is the name under which the Aṣṭasāhasrikā Prajñāpāramitā sūtra (the Perfection of Wisdom in Eight Thousand Lines) is widely known in Mongolia. One of the earliest texts of Mahayana Buddhism dating back to the 1st century CE, the sūtra was translated into Tibetan in the 9th century, and in the course of the 17th century multiple Mongolian translations from Tibetan appeared. The present publication introduces eight Mongolian translations of the Aṣṭasāhasrikā as part of the literary process of the 17th century — a period of great significance for Mongolian literary culture. The results of a comparative textual analysis show how a sacred canonical text was handled by the translators of the period, allowing to make observations on the methods and aims of their work. The material is presented in three blocks: the extra-textual data on the eight translations (based on the colophons), the comparative analysis of the texts’ structure, vocabulary and style followed by conclusions and observations in a broader context, and the textual material itself in the form of comparative tables that show the overall structure of the eight translations, the text of one chapter and a selection of vocabulary. Appendix IV was not included in the book. It can be downloaded below as a *.PDF file.